SAUSAGE AND GRAVY COBBLER WAS ORIGINALLY PUBLISHED IN DECEMBER 2016. 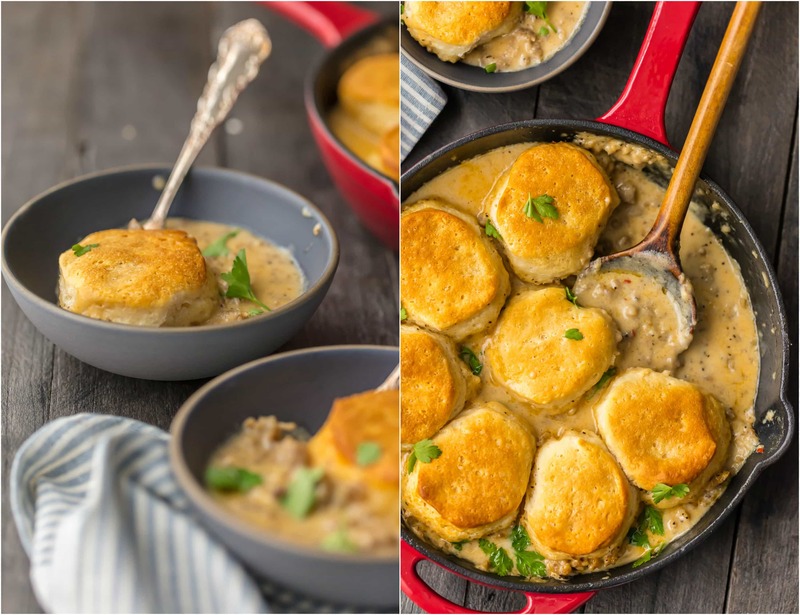 SAUSAGE BISCUIT GRAVY COBBLER is a delicious and easy one pan meal. 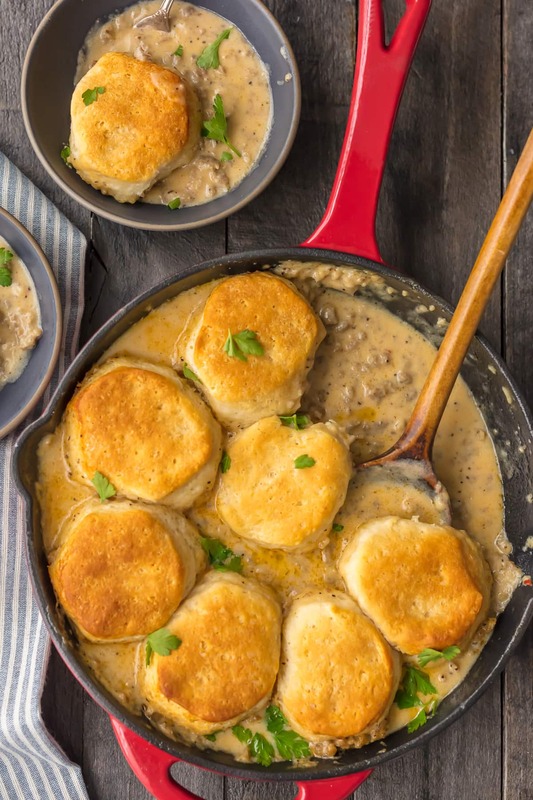 This skillet breakfast recipe takes classic biscuits and gravy and makes it even better. This sausage and biscuits recipe has quickly become our very favorite Christmas morning breakfast and for good reason. 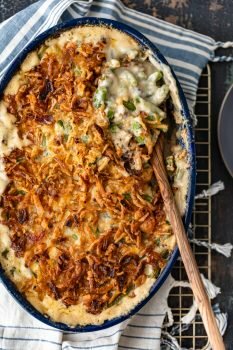 Holiday comfort food at its finest! 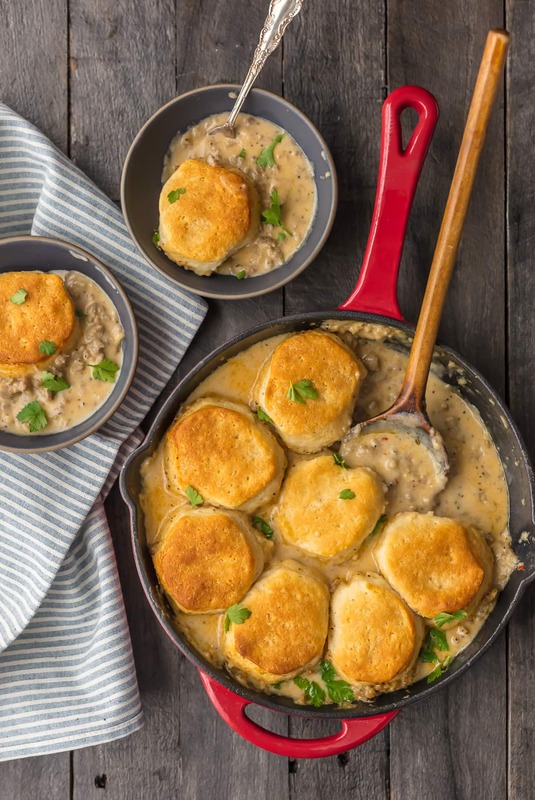 Sausage Biscuit Gravy Cobbler turns classic biscuits and gravy into a fun and easy one pan recipe. This skillet breakfast is perfect for Christmas or any weekend morning! 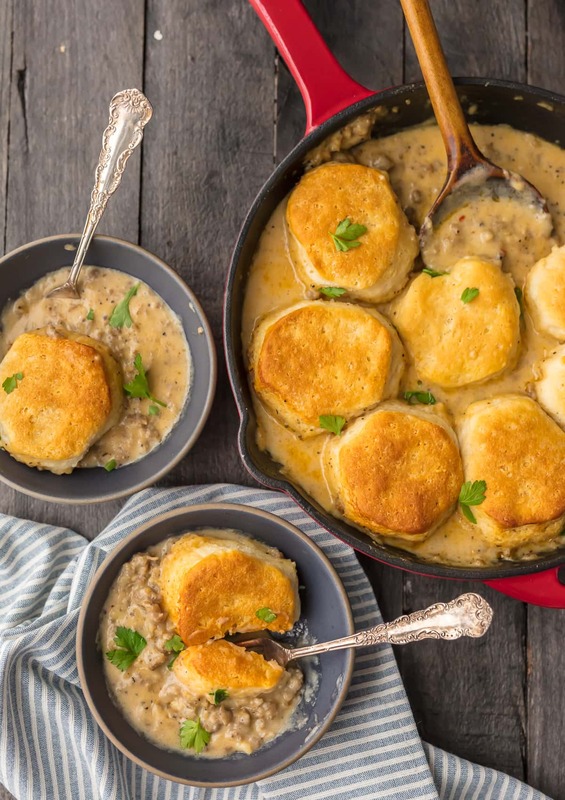 I’m just so excited about this Sausage Biscuit Gravy Cobbler recipe! I will readily admit, I have never been the biggest biscuits and gravy fan, but this is different. It’s my mom’s sausage gravy recipe (which is AMAZING), its being cooked in a skillet (which is my FAVORITE THING EVER), and it’s SO stinking easy (which is basically my mantra). Sausage, biscuits, and gravy is such a classic breakfast. I wanted to make it a little more fun and a little bit easier to prepare for a family or guests on busy mornings. 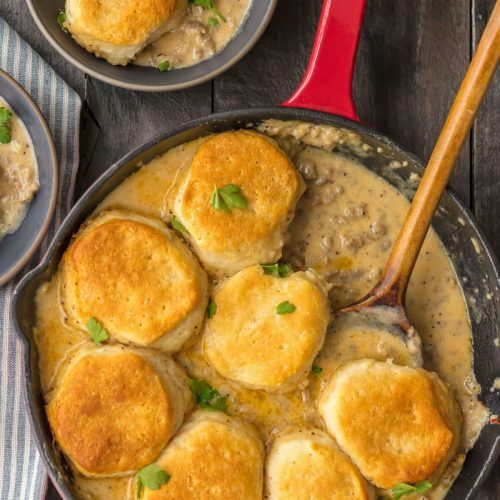 So of course I had to turn it into a one pan recipe that combines the sausage, gravy, and biscuits into one skillet (less dishes to clean!). 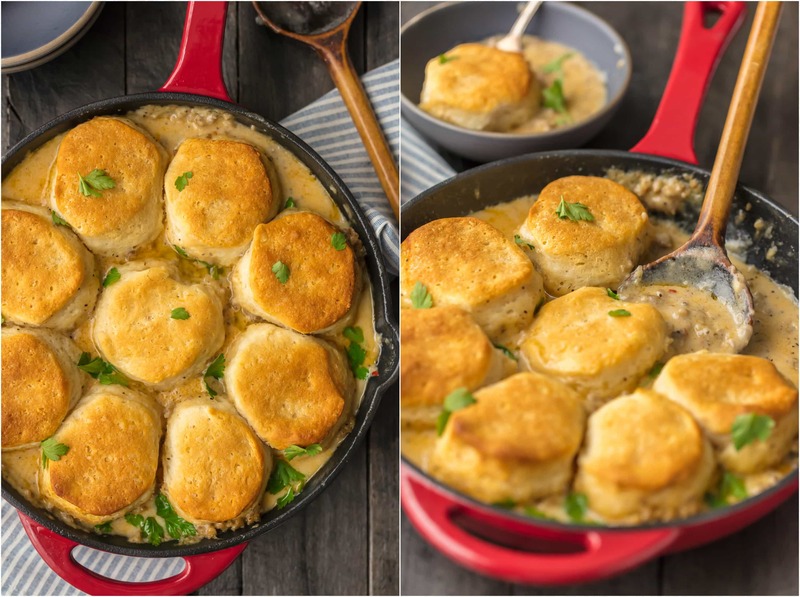 The way we cook the sausage gravy and then bake the biscuits straight on top makes it like a savory breakfast cobbler. So delicious! I think this sausage and biscuits skillet breakfast just might be the ultimate Christmas morning breakfast recipe. It’s going up against my Meat Lovers Breakfast Pizza, Pumpkin Pie Monkey Bread, Easy Cinnamon Roll French Toast Bake, and lots of other holiday breakfast ideas, but this one still comes out as a clear favorite for me. It just might be this year’s winner. You’re in for a treat today, folks! This one pan Sausage Biscuit Gravy Cobbler is the perfect holiday breakfast recipe. This tasty skillet breakfast will impress everyone who eats it! Talk about comfort food for breakfast! It doesn’t really get more comforting than a classic biscuits and gravy recipe. Add in some spicy sausage, use pre-made grands biscuits, make it all in JUST ONE PAN, and you’re really in business. Is this foodie heaven? It’s just the perfect Christmas morning breakfast! 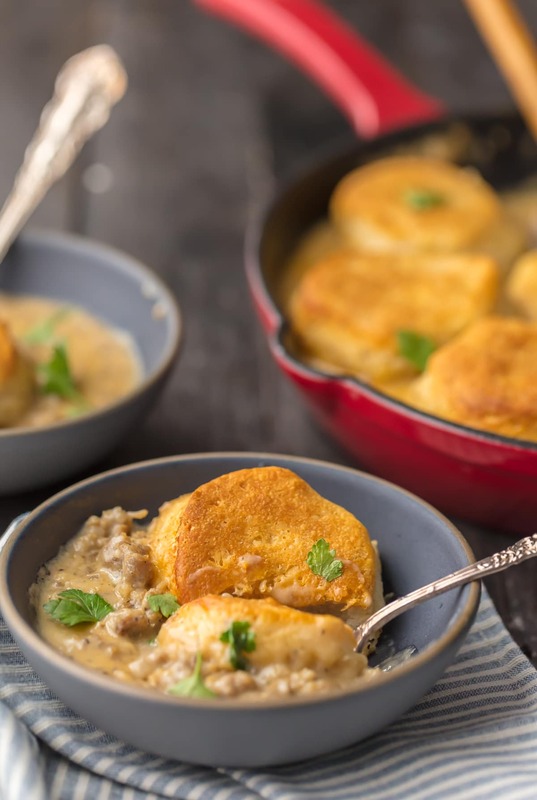 If you want something super easy and delicious, and something that will be loved by the entire family, this Sausage Biscuit Gravy Cobbler is the recipe for you. I mean, if I’m going to wait to open presents until after I’ve eaten, then the meal better be AMAZING. This Sausage Biscuits and Gravy definitely makes the cut! My favorite thing about this skillet breakfast is that it’s made in just one pan. That makes cooking easy, and it makes clean up even easier. Dishes are by far the worst part of cooking for guests over the holidays, so this is really the perfect thing to serve. Are you a fan of one pan meals? Try these other favorites: Chicken Parmesan Pasta, Honey Garlic Chicken and Veggies, and Apple Butter Pork Chops. This sausage biscuits gravy cobbler recipe is such a simple process. There’s nothing complicated about it! You’re cooking the sausage biscuits and gravy all together in one pan, so there’s really no hassle. Just an easy breakfast recipe that everyone will love! Crumble and cook sausage in a skillet until brown. Sprinkle the flour over the sausage and stir to combine. Stir in salt, paprika, red pepper flakes, and milk. Remove pan from heat and place ready-to-bake biscuits in the skillet, directly on top of the gravy. Brush the top of each biscuit with melted butter. Move skillet to the oven and bake at 350°F until tops of the biscuits start to brown (check package instructions for baking time). Let the sausage biscuits and gravy cool for at least 5 minutes before serving. Use a spoon to serve a biscuit and plenty of sausage gravy onto each plate or bowl. Just like classic biscuits and gravy but BETTER. Christmas morning is great for so many reasons, but it’s not truly amazing without a good breakfast. When you have your whole family together, and guests staying with you to celebrate, you don’t want to just give everyone boring toast and cereal. You want something fun, but you also want something easy. 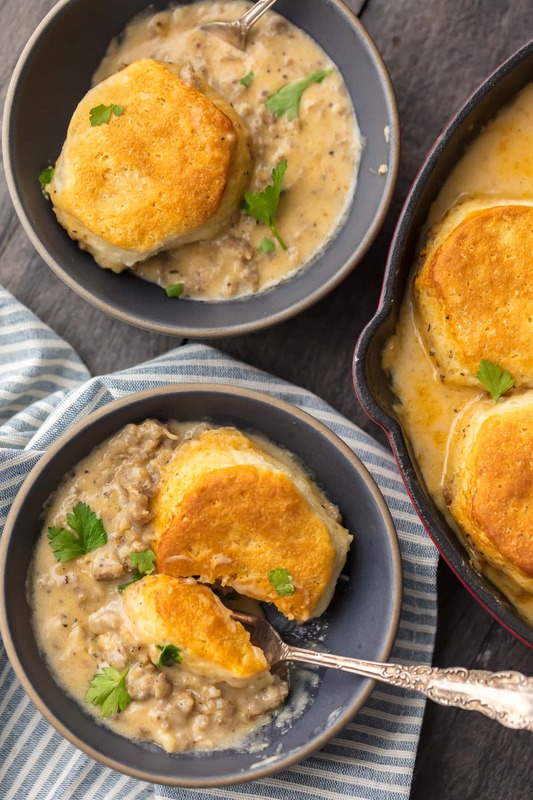 That’s what makes this Sausage Biscuit Gravy Cobbler the perfect match! This skillet breakfast is so delicious and clean up is a breeze. This sausage biscuits and gravy recipe goes beyond Christmas, though. Make this any time you have guests staying with you, and you can impress them with this simple yet tasty breakfast. Or just throw this together on weekend mornings to show your family how much you love them. There’s never a bad time for sausage and biscuits! I just can’t believe how well this Sausage Biscuit Gravy Cobbler came together. It’s a Christmas miracle! Not the biggest Christmas miracle ever, but maybe the biggest food blog miracle. 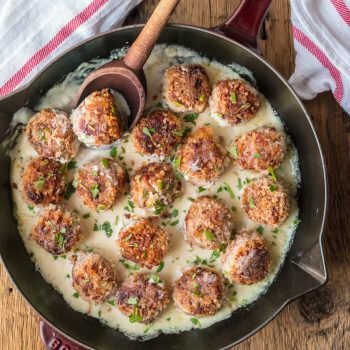 We will be making this sausage biscuits and gravy skillet recipe for years and years. Taste it and I know you will too! See the recipe card below for details on how to make Sausage Biscuit Gravy Cobbler. Enjoy! Sprinkle the flour over the cooked sausage and stir until flour is absorbed. Add seasoned salt, paprika, red pepper flakes and milk. Stir until well combined. Over medium-low heat, cook the gravy (stirring often) until gravy begins to thicken but is still a little soupy. Remove pan from heat and place biscuits evenly over the gravy. Brush the top of each raw biscuit with melted butter. Place skillet in the oven and bake until biscuits are golden on top. Transfer skillet to cooling rack (or cooled stovetop) and allow to set for 5 minutes. Oh boy, these looks good! And your Mom’s gravy recipe sounds amazing! I’ve never been a Biscuits and Gravy fan either, Becky, but this might just change my mind. Your pictures make me want to reach right in and grab a biscuit, but my computer screen keeps stopping me!!!! aww…!! im so much greedy about this biscuits. i think it can be easily prepared in our own home and i will try it. thanks for sharing this recipe secrets with us. This is nottypical breakfast casserole, it’s the type that will earn you RAVE reviews! Simple, easy, and a great way to start your day and it is perfect cooked in a cast iron skillet. Ummmmmm YES PLEASE. Definitely making this over the holidays. YUM. Did you use breakfast sausage or regular italian sausage? Regular Italian Sausage. Hope you love the recipe! looks very tasty, want to try at home. By ready to bake biscuits, are you talking canned biscuits or would frozen biscuits work?